I have heard no updates about when HTC will release 2.1 firmware for the magic (ht-03a) - it appears to still be scheduled for this summer. 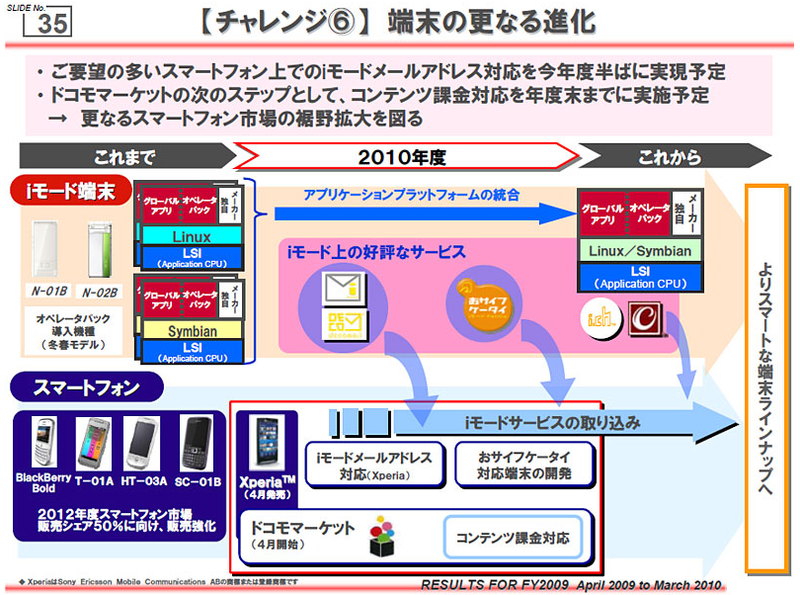 From this ridiculously cluttered slide I found at IT Media, it appears that the only smartphone that will get a docomo cell phone email address is the Xperia. Hi, this post is a bit outdated, but I just found your blog a couple of days ago. Has it been determined yet if it's possible to root the Xperia to do a custom Android install on it? Would it still be able to connect to the network and work as a proper normal keitai? I ask, because both Japan's cell companies, and Sony as a hardware manufacturer, are notorious for being extremely restrictive in what they allow their customers to do with their equipment and services. 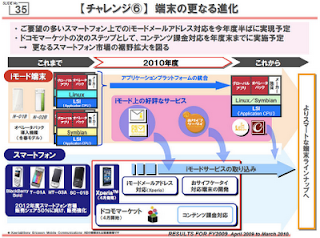 But, I've skimmed the recent posts and noticed the nice trend toward sim unlocking and more open gear, what with the additional pressure from DoCoMo against SoftBank and the iPhone. I'm not too keen on how restrictive the iPhone is, and am looking forward to picking up an Android handset specifically for unlocking, so I can do whatever I want with it (I'm a software engineer) without having to beg the cell providers, Sony's, or Steve Jobs for permission. Right now, HTC handsets have the most support from the hacking community since people have been tinkering with them for so long. But it is slim pickings in Japan for HTC hardware, the aging magic on Docomo or the Desire on Softbank. While the magic is old hardware, it runs well cyanogen's latest stable builds based on eclair, and it sounds like froyo will come to the magic as well via cyanogen. And given the current price of the magic with docomo, it might not be a bad idea to pick one up since last I checked you could do it without a contract. While the communication and infrastructure ministry said they are going to start unlocking phones at the end of the year for the "next generation" of phones, who knows what will really happen. Softbank has bitterly complained about it and came out and said it would hurt them because everyone will jump to docomo. While I don't have so much pity on them, they are in a tough spot since their lack of the low frequency band that gives docomo better underground/indoor/mountain penetration is not their fault but the govt's. So, softbank has a valid point that government forced unlocking will hurt them since the government won't let them level the network playing field. And what is next generation? Perhaps LTE?